I know normally I run tack review posts on Thursdays, but we're gonna mix it up a little this week! 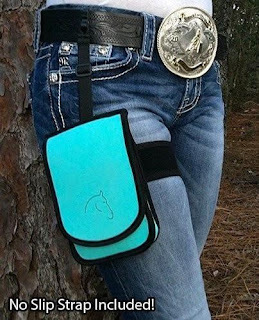 A few years ago, I ran across a Facebook page advertising a product called a Horse Holster. I was intrigued, because I try to make it a habit to carry my phone when I ride (because I frequently ride alone), but it can be tricky, especially when it's too warm to wear a jacket with pockets. I find most breeches pockets aren't really comfortably large enough for the smartphones of today (minus one pair of FITS summer tights I have with a huge thigh pocket). I checked out their site immediately, but found the initial selection of colors a little lackluster. I "liked" the page anyway, because I hoped eventually they'd expand the color options. And sure enough, a few weeks later I saw an ad for TEAL. Fresh out of the packaging! Obviously, I had to have one. 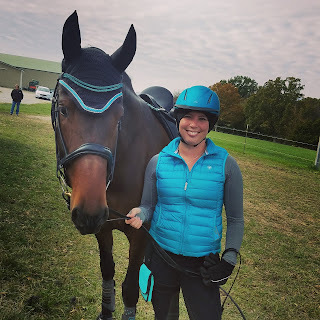 This was shortly after I destroyed a phone on a trail ride -- it fell out of my jacket pocket and Ruby stepped on it.... ughhhhh. So I forwarded a link to my dad as a possible birthday idea, and he came through like a champ! I got it in May of 2016 and immediately put it to good use. Ever since then, I've used it on probably 90% of trail rides and probably upwards of 70% of my arena rides. It's especially key when I'm using my bluetooth speaker! Honestly any time I don't use it is almost always just because I forgot, not because I made a conscious decision to not use it. 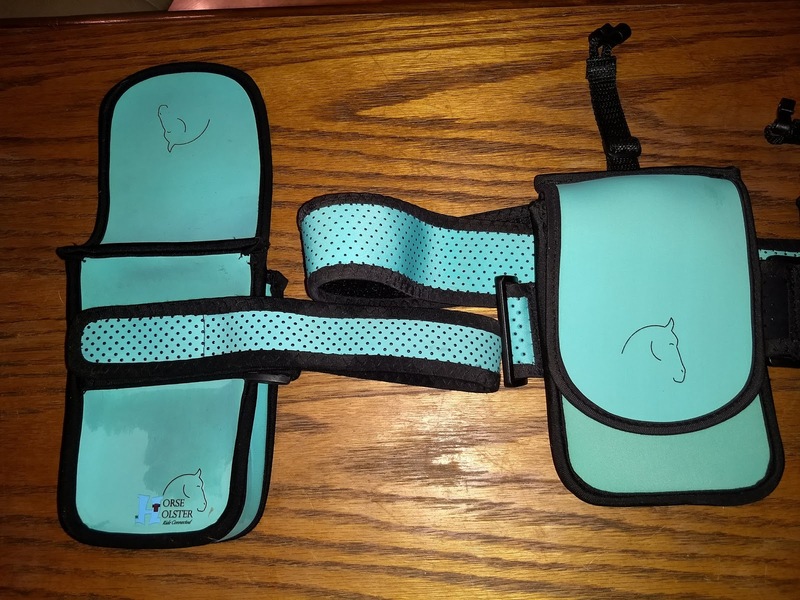 It stays put while I ride, and has never damaged my saddle in any way (the two most common questions people have for me haha). Wearing it on a ride with Cinna this spring. Stock photo from their website -- when I got my first one, the no slip strap wasn't available yet, but I do have them on my spares. *Longer leg strap will still fit thighs as small as 22"
And of course on Ruby. 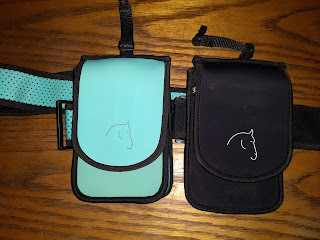 I loved mine so much that when I saw they were having a sale on factory seconds last fall (with some zipper issues), I picked up 2 more (one black, one teal) for myself and DH. I don't really use the zippered pocket, although I can see where it would be helpful if you wanted to carry an ID or keys or something. 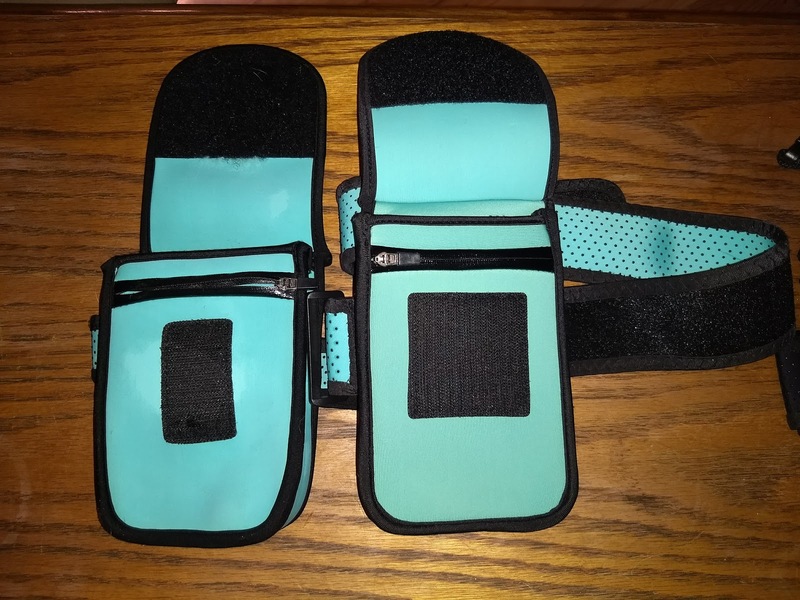 The new ones have wider straps, bigger/stronger velcro, and the new "no slip strap". 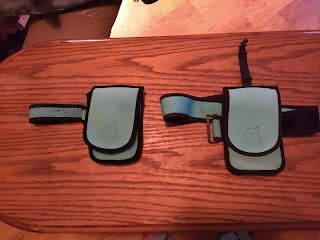 We haven't actually used them yet (mostly because we didn't do too much trail riding this winter, plus I didn't see the point in starting to use the new one when my old one still worked fine), but hopefully we will break them out on some adventures this summer! My original (sorry, the flash didn't go off so it looks a little washed out). Also I had just washed off a dirt stain so any discoloration is from it being damp. Original on the left, newer one on the right. 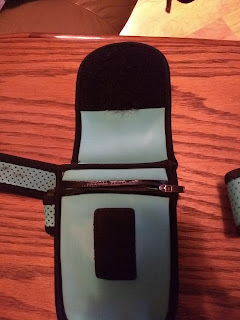 You can see the wider strap, and the no slip strap at the top. The original -- you can see a little pilling underneath the black velcro at the top. Still 100% functional! Also apparently I missed some stains on the strap? Haha. Yeah the original on the left was still really wet for my impromptu photoshoot, haha. But a better comparison of the strap widths. 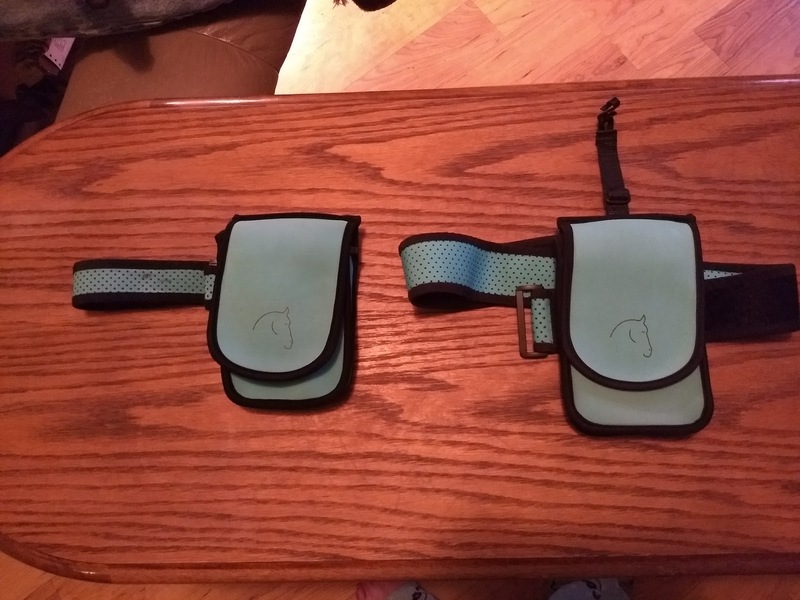 Original on left, new on right -- you can see the difference in the velcro sizes. Also the newer ones have way stronger velcro. I was a dutiful wife and got DH's in black (since I figured he might object to teal). Also, I thought it might be useful to be able to tell them apart, haha. 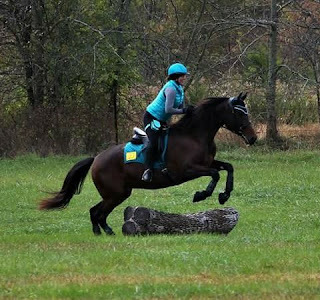 Rocking it at the Haunted Hunter Pace last fall hopping over some logs. As of writing this review, it looks like most color options are priced at $29.99. My first one was a gift, but I feel like they were a bit cheaper then. Maybe like $25 for the original style? If you sign up for their email list or follow their Facebook page, sometimes you can buy a factory second for much cheaper. My 2 y/o one still looks great -- there is some pilling on the underside where the inside sometimes misses the velcro, but it still looks perfect from the outside. It's machine washable, although I've only hand washed mine after some muddy trail rides. Current options include black, blaze orange, blue, green, burgundy, navy, pink, purple, red, teal, and several patterned options! 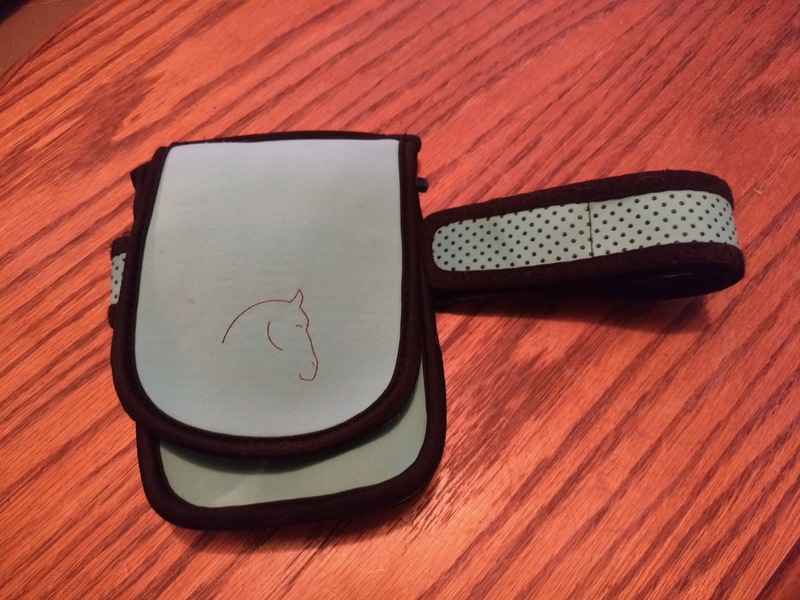 Overall, if you like to have your phone on you while you ride, I highly recommend one of these! I found I remembered to use it much more frequently if I tucked it into my grooming box, but I still do forget occasionally haha. 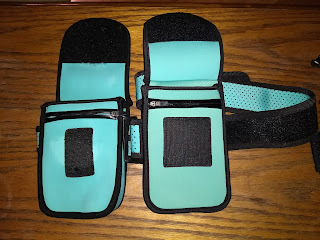 I definitely need this for the trail - thank you for the review! You're welcome! 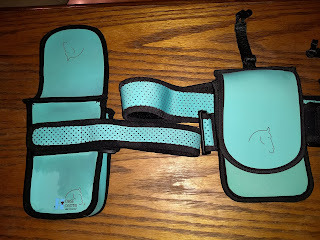 I love mine and have been meaning to review it for ages! i so appreciate your commitment to the color scheme haha. it looks great! So it doesn't slip down at all while you ride? I need one of these! Great question, I just added that to my post. I've never had it move while I'm riding, but if I walk around pre or post-ride with it on, it does tend to slide down. I've been eyeing these but they are upwards of $40 CAN which is more than I think it's worth. So I will wait until I find it at a price I'm willing to pay. I would definitely sign up for their email list -- the "factory seconds" I got were like $7.50 each (not sure what the CAD conversion is for that) and they're totally functional for my needs. Shipping would probably still be beastly, which is unfortunate! Seems really useful if you have a decent sized phone! I've stuck with the iphone SE which fortunately fits in almost all breech pockets. But if they stop making that size phone, I'll have to look into one of these! I have one similar to this but it's an armband... I always ride with my phone since I'm almost always alone, so it's a must for safety. These are way prettier than what I have though... might have to invest! I have thought about going with something like this for my phone (like you, I ride alone and feel better with my phone on me). Does having it on your thigh bug you? That's my only hesitation is that having it around my thigh will be irritating. I've honestly never even noticed it once it's on, but that might be a person-by-person thing. Most of my rides are flatting, since I don't really jump, but it didn't budge or bother me when I wore it on the hunter pace over cross country jumps either! 😂😂😂 I mean, they have other blue options? 😉 Maybe email them and see when they'll be back in stock? I did notice teal was sold out when I was grabbing the links for this post, lol. That is good to know! Thank you! And yeah.....gonna have to wait on this one LOL! 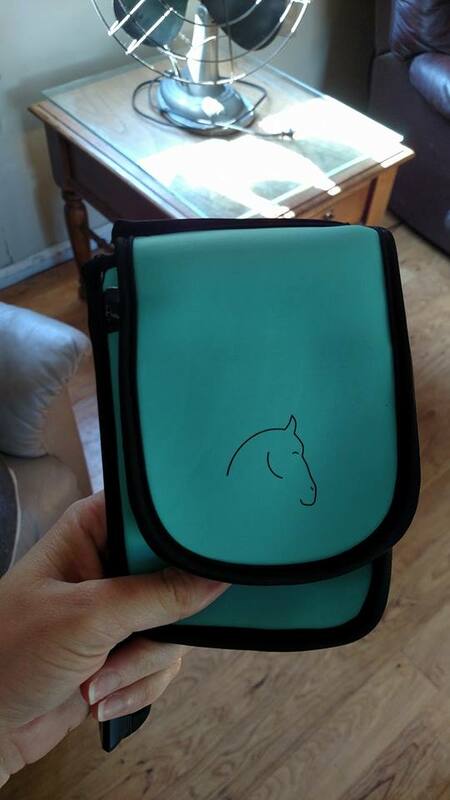 Teal or nothing! I have one and I love it too! It's never bothered me, but YMMV obviously! They're also making one that clips to a belt I think, but it's only available in limited patterns right now. I just can't do the bra thing 😂 I have in a pinch, but I can't do it regularly. I'm sorry you've had a less than ideal experience with yours. Obviously to each their own. I've had mine for almost 2 years of regular use with no issues and still am happy to recommend it to others. Interesting that it attaches with a leg strap! 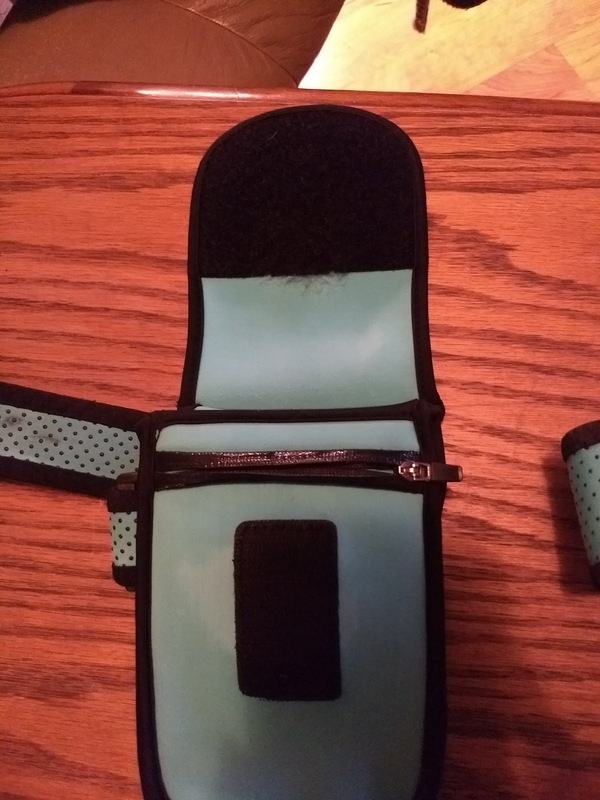 I just bought a holster myself! Not the one you posted but I may consider it if I return the one I got.